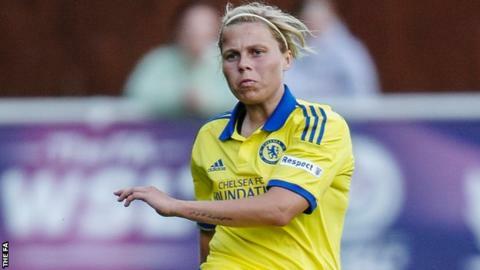 Chelsea's Continental Tyres Cup win at Reading is "massive" for the club, says captain Gilly Flaherty. WSL 2 side Reading went 2-1 up after Flaherty's early strike, before Millie Bright and Ji So-Yun rescued three points for the WSL 1 leaders. "That's all we know how to do, how to keep going until the final whistle, and it paid off for us," Flaherty said. "It was a massive response from us and I think everyone in the league is watching us and how we reacted." Flaherty continued: "Probably a few were rubbing their hands when they saw we were 2-1 down. To come back to 3-2 and get three points is massive for us." Chelsea sit second in Group One, while Millwall top the group after a Fliss Gibbons hat-trick helped the Lionesses come from behind three times to claim a 5-3 home victory against fellow WSL 2 outfit London Bees. The away side took the lead through Ashleigh Goddard's curling effort, before Gibbons tapped in her first goal to equalise. Bees striker Emma Whitter then netted twice either side of Goddard's second of the night, which she looped in off the bar. Millwall levelled the score at 3-3 thanks to Ciara Sherwood sliding the ball over the line, as the hosts chased a winner. They took the lead for the first time when Goddard slotted home to complete her hat-trick and the win was confirmed on 84 minutes with substitute Rinsola Babajide's well-taken finish.